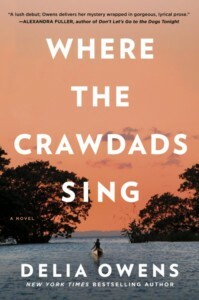 One of the most popular books right now is Where the Crawdads Sing by Delia Owens. Set on the coast of North Carolina, it tells the story of Kya Clark, a loner living in the marsh outside of town. When a man is found dead, she’s suspected of killing him. It’s a coming-of-age story, with odd yet likeable characters, and the location is lovely. Sadly, if you want to borrow it from the library and read it, you will have to wait. Even though we own 15 copies (including 5 print, 1 large print, 5 ebooks, 3 downloadable audiobooks, one large print and one CD audiobook), nearly all are out and have waiting lists. Go ahead and get added to the waiting list. It’s worth it. In the meantime, here’s some books you might enjoy while you wait. First up is an American classic: To Kill a Mockingbird by Harper Lee. The author won a Pulitzer Prize for her beautifully written and complex coming-of-age story. Seen through the eyes of a young girl, this story of a lawyer’s defense of a black man unjustly accused of a crime in the racially-charged South is one you won’t soon forget. With 4 print copies, 3 ebooks, an audiobook, unlimited downloadable audiobooks and even a graphic novel version, getting hold of a copy should be relatively easy. You might also take a look at On Chesil Beach by Ian McEwan. Set on the coast of England, it tells the story of a newlywed couple celebrating their wedding. A very well written book, it looks at how decisions made early on in a relationship can echo down the years, for good or bad, and was made into a movie in 2017. We have one print copy and one audiobook on CD. My Absolute Darling, by Gabriel Tallent, is set on the northern coast of California. Our heroine is Turtle Alveston, a fourteen-year-old girl growing up socially isolated since the death of her mother. While this book is as lyrical and descriptive as the others on this list, the action can be a little more …. disturbing. It may not be for everyone, but it is a very good book. We currently have one print copy. Tell the Wolves I’m Home is yet another story of a fourteen-year-old girl facing challenges as she grows up. Set in 1987, Carol Rifka Brunt tells the story of June Elbus, comfortable only being herself around her uncle, famous painter Finn Weiss. When Finn dies of a disease no one will talk about, she’s devastated. As she strikes up a friendship with a man she saw at Finn’s funeral, she starts to find a way back to herself. With characters who are slightly odd, but likeable and sympathetic, this is a book you may want to read again. One print copy and one downloadable audiobook are available in the library’s collection. Lastly, we have The Gravedigger’s Daughter, by Joyce Carol Oates. Oates is an award-winning American writer, and this book easily meets your expectations from her. Set in the mid-1930’s, before America enters World War II, it tells about a family who immigrates from Nazi Germany to upstate New York. The father, who previously taught high school, is only able to find work as a gravedigger and caretaker, a much less prestigious job than he had in Germany. After a tragedy, his daughter Rebecca strikes out on her own into America on a journey re-invent herself and find her place in this country. An excellent book, the library has one print copy available. That’s it for this month. I’ll be back next month with more suggestions for alternative titles to read while you wait for your hold to come in.